Pickles are strangely addictive. 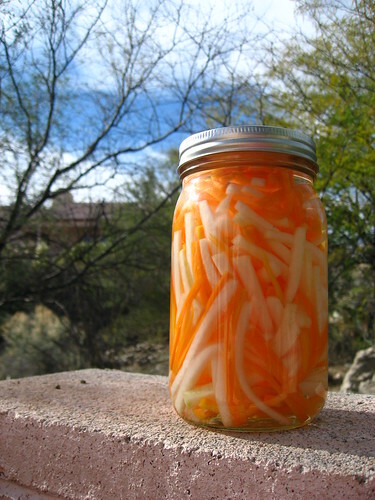 I don’t know why more foods aren’t pickled (nor why I don’t make pickles more often). 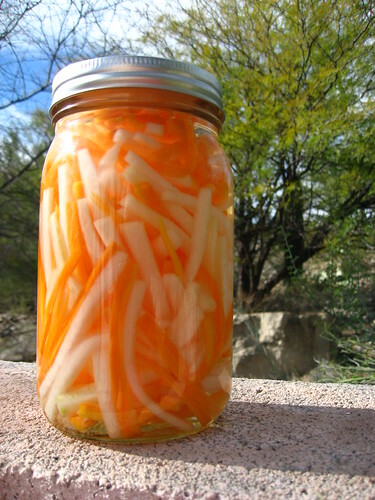 This particular recipe is for refrigerator pickles (i.e. they aren’t processed and sealed, thus they should last about a month in the fridge) and are sweeter rather than salty. In fact the flavor is somewhat reminiscent of bread and butter pickles, which was noted by many other sites as I was searching for a good recipe. Thus, I feel like I must have done these right! I came across this recipe via the NY Times and tweaked it slightly. It all started when I was researching recipes that that use Daikon Radishes (which came in this week’s CSA share). If you can’t tell, I try think outside of the box (a little) when it comes to using up my fruits and veggies. It was like it was meant to be when I found this recipe! In this week’s CSA share we had also gotten beautiful little carrots, so how could I not give these a try? I already had all of the ingredients on hand, and the recipe looked pretty straightforward. This pickle is actually traditionally called “Do Chua”, and is a common Vietnamese pickle that’s typically stuffed into banh mi sandwiches (ever had one? They’re incredibly tasty). I don’t know if I’ll go so far as to make my own banh mi sandwich – (although I’m tempted) but we’ll probably end up using these pickles as a topping for salads… or just for general snacking (as I said, I tend to get addicted to pickles!). I think they’re pretty good, and I’m happy that I found a tasty way to use the Daikon! So what are you doing? Get into your kitchen make some pickles! Place carrots and daikon in a bowl and sprinkle with salt and 2 Tbsp sugar. Knead vegetables for about 3 minutes, this will help them expel their water. Stop kneading when vegetables have lost about 1/4 of their volume. Drain in a colander and rinse under cold running water, then press gently to expel extra water. Transfer to a glass container for longer storage (I used a large jar as I knew I’d want to store the pickles in the fridge). In a bowl or large measuring cup (for ease of pouring), combine 1/2 cup sugar, the vinegar and 1 cup lukewarm water, and stir to dissolve sugar. Pour the sweet brine over the vegetables. 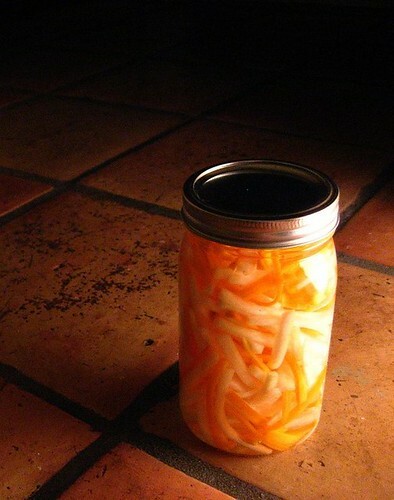 Let marinate at least 1 hour before eating, or refrigerate for up to 4 weeks.